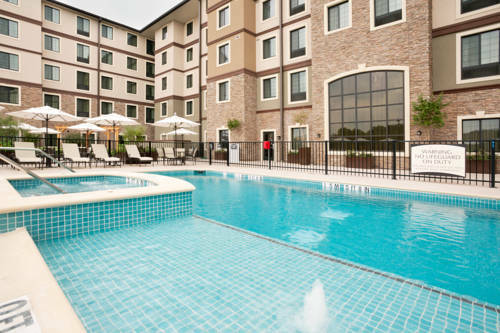 The Staybridge Suites San Antonio Stone Oak is the perfect blend of upscale extended stay urban hotel located in a relaxing, convenient location just 10 minutes north of the, San Antonio International Airport. Our premier location is close to many attractions such as the Riverwalk, The Shops at La Cantera, Valero Texas Open, Morgans Wonderland, Sea World, Six Flags Fiesta Texas, Top Golf, The University of Texas at San Antonio and the Alamo; make it an excellent choice for business travelers and vacationing visitors. Neighboring facilities include South Texas Spine & Surgical Hospital, Methodist Stone Oak Hospital, North Central Baptist Hospital, Tesoro Corp, Baker Hughes, Chesapeake Energy, Cisco Systems, Microsoft, JP Morgan Chase, EOG Resources, Zachry, and Valero Energy. Each of our 135 guest rooms are spacious; apartment-style studio, one bedroom or two bedroom suites; complete with a full kitchen with microwave, stove top, dishwasher and full size refrigerator making it perfect for guest staying more than a few nights. Our guest will be sure to enjoy our 15,000 sq. ft. outdoor deck area featuring BBQ pavilions, outdoor pool & spa, and outdoor living area with fireplace, casual seating plus large screen TV. We also include many complimentary amenities such as high-speed wireless Internet access, hot buffet breakfast and our legendary evening reception. Brazilian Steak House, Chama meaning " flame" in Portugue. At se, is the essence of an authentic Brazilian steakhouse. At Chama Gaucha, we have the same passion and desire to bring the churrasco, a fire pit or grill, experience. Six Flags Fiesta Texas is a large theme park with both rides and a water park included in the same ticket price.